What a fantastically horrifying true crime novel! Loved it! United in their obsession with a grisly Italian serial murder case almost three decades old, thriller writer Preston (coauthor, Brimstone) and Italian crime reporter Spezi seek to uncover the identity of the killer in this chilling true crime saga. From 1974 to 1985, seven pairs of lovers parked in their cars in secluded areas outside of Florence were gruesomely murdered. When Preston and his family moved into a farmhouse near the murder sites, he and Spezi began to snoop around, although witnesses had died and evidence was missing. With all of the chief suspects acquitted or released from prison on appeal, Preston and Spezi’s sleuthing continued until ruthless prosecutors turned on the nosy pair, jailing Spezi and grilling Preston for obstructing justice. Only when Dateline NBC became involved in the maze of mutilated bodies and police miscues was the authors’ hard work rewarded. This suspenseful procedural reveals much about the dogged writing team as well as the motives of the killers. First of all, if there is anything I have learned from scary movies it is if you are a young couple having a romantic interlude in a secluded area, you are in deep, deep trouble. There is always some ax-wielding, gun-toting, hockey mask-wearing psychopath who hates nothing more than young couples having romantic interludes in secluded areas. Apparently, real life is JUST LIKE SCARY MOVIES! And this book not only has the scary movie psychopath, it has a really cool author-crime reporter team doing some serious snooping. And that’s what’s so fantastic about this book. The crimes themselves are fascinating, but so is the impact these crimes have on those trying to solve the puzzle. Preston and Spezi end up in way over their heads – suddenly they are the focus of a police investigation! Who saw that coming?! Not I! Exclamations abound. In ways it reminded me of Midnight in the Garden of Good and Evil by John Berendt, but this reads less like a novel and more like journalism. And it was really freaky reading about how corrupt the Italian justice system is. I had just watched a Dateline about another Italian trial, and it made me go back and do more research on this. And then I had to watch the Dateline on the Monster of Florence as well! My only complaints were: 1) that I had trouble tracking all the characters names, partly because there is a million over many years, and partly because I have trouble remembering names when I don’t know how to pronounce them, and 2) I wanted to know the solution to the crimes! But that, I know is not the fault of the book- they can only supply what the evidence shows. Scary stuff; stay away from secluded romantic interludes. 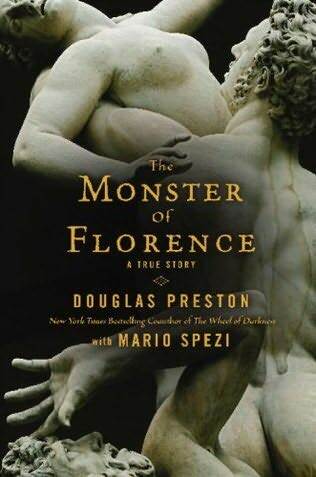 This entry was posted in Book Reviews, Nonfiction and tagged Douglas Preston, Midnight in the Garden of Good and Evil, Nonfiction, The Monster of Florence. Bookmark the permalink. Also, you got a lot of book review blogs linked over there on the right. I don’t think I realized your list was so long! Sounds interesting! It reminds me of the Zodiac case in the 1970’s don’t know why.